When a chill is in the air and the harvest moon rises high in the sky above forests of leaves turning orange, yellow and red, you know it’s fall. And while some people prefer the sunny days and flowers of spring and summer, the rest of us know there’s a particular magic to autumn that makes it the perfect time to get married. 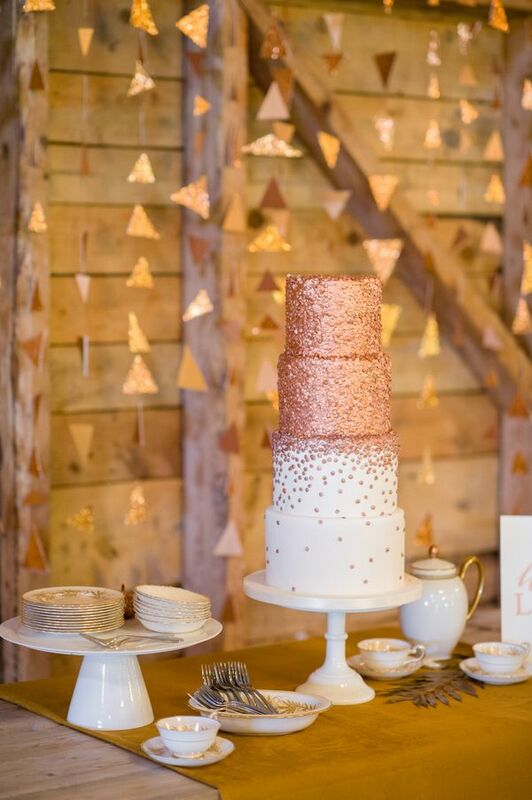 But just as your guests will need to wear something a little warmer than they would during a summer wedding, so will you need to alter your wedding decor and style slightly so it fits with the dreamy, moody, crisp fall aesthetic around you. Your cake is the perfect opportunity to bring in some seasonal style. 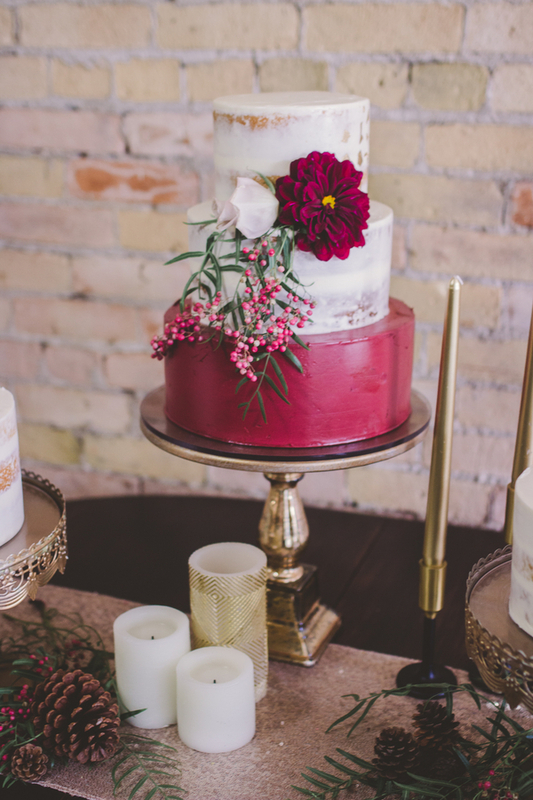 From pops of color thanks to orange fondant flowers to a cake that looks traditional on the outside but is filled with a buffalo check pattern that gives it a surprisingly rustic flair, these enchanting wedding cakes will make you want to say I do in the fall. 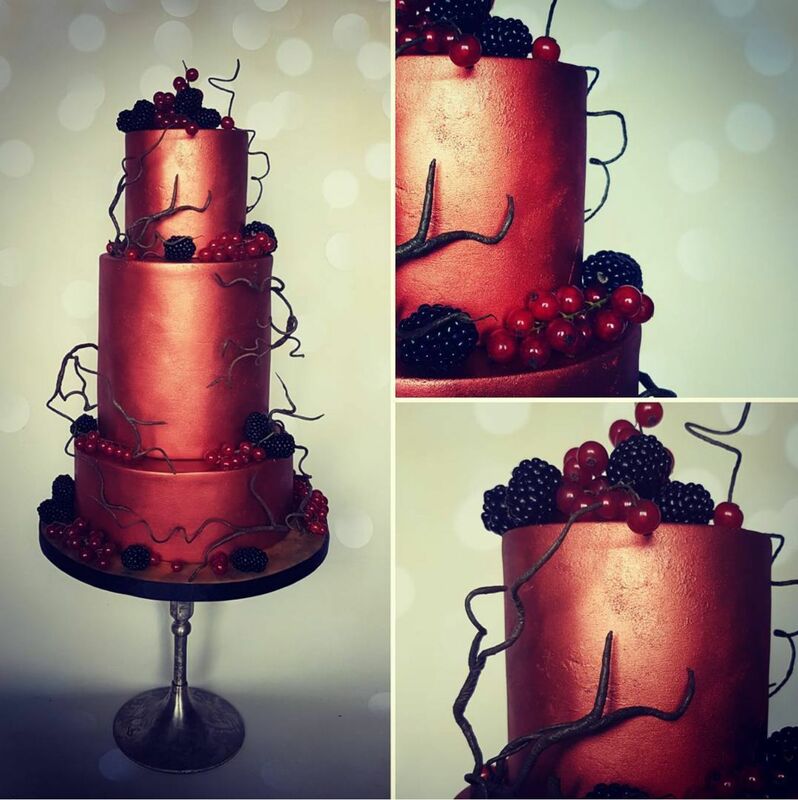 The deep, pinkish-red on the base layer of this cake adds a flash of color without being too overwhelming. 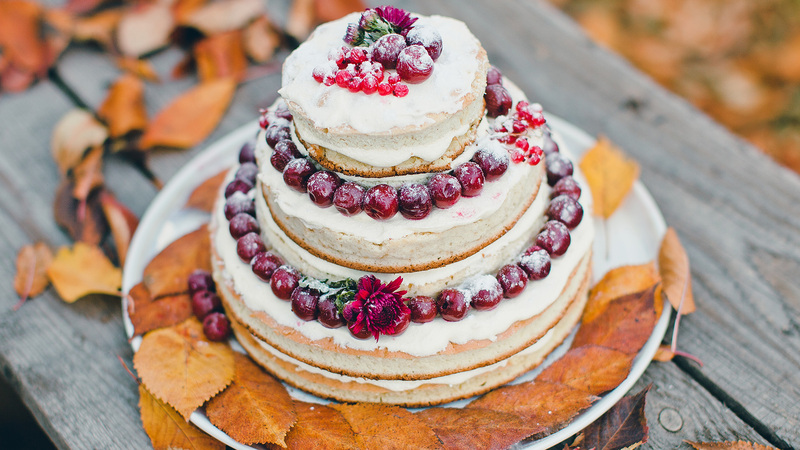 Delicate pine fronds decorate this rustic cake. 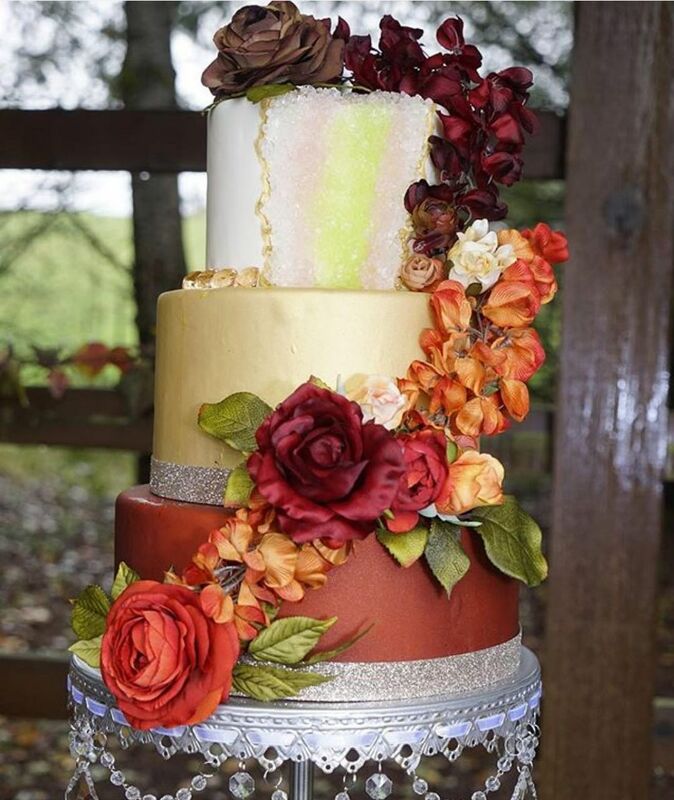 Decorated with edible coper paillettes, this cake brings glamour to a fall wedding. 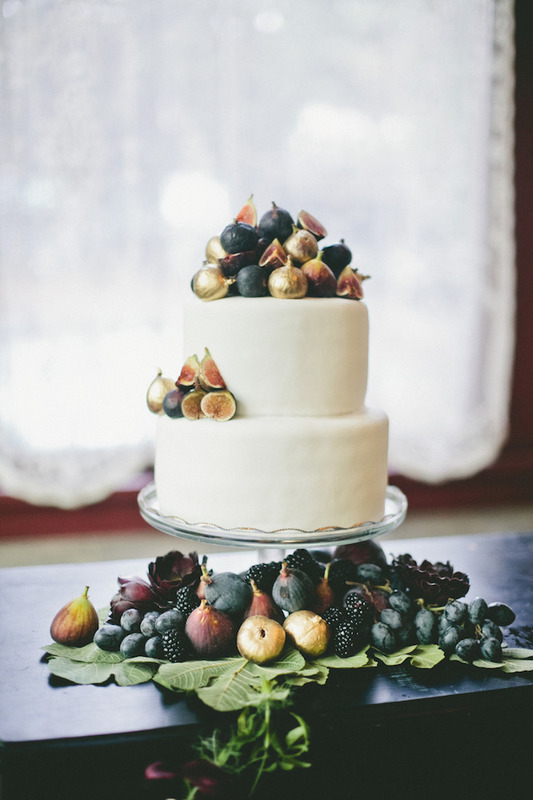 Juicy figs, grapes and blackberries adorn this simple white wedding cake. 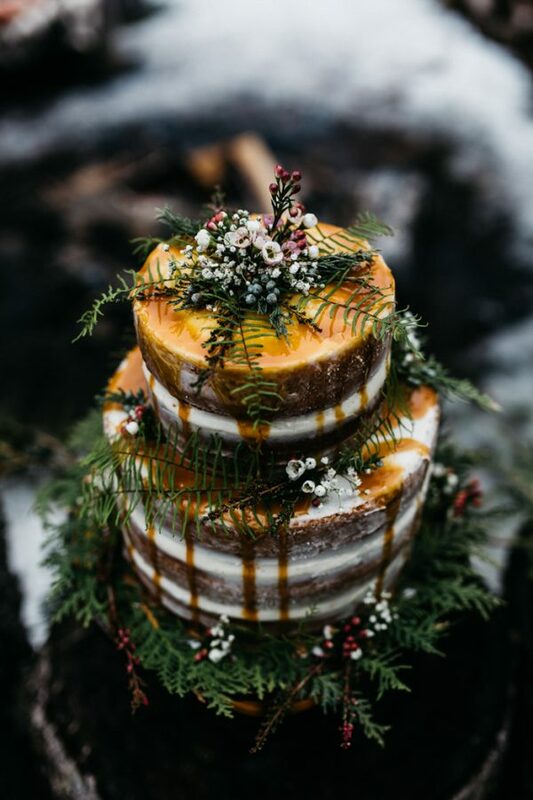 Black branches contrast sharply with this shimmering dark-orange cake, perfect for a fall wedding. 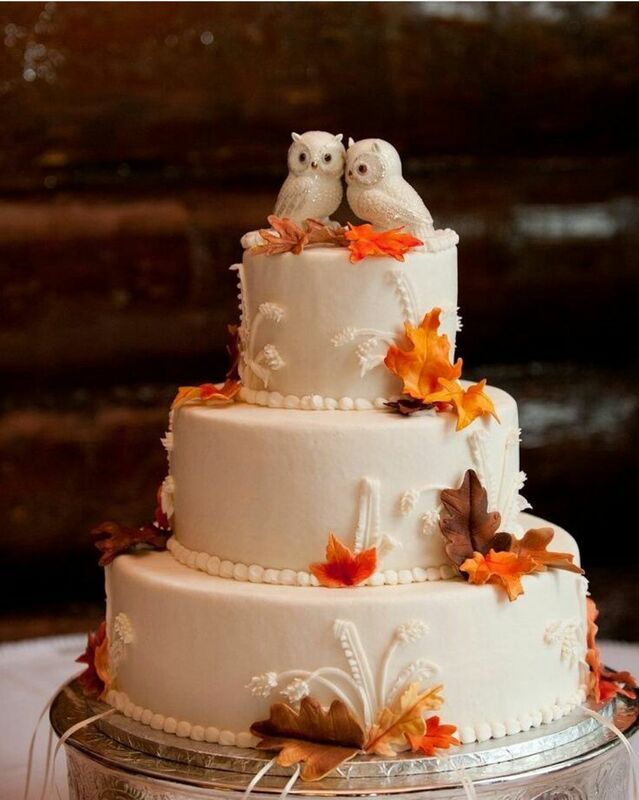 Trade out a traditional wedding topper for two snowy owls to make this cake, reminiscent of late autumn. The naked-style crumb coating of frosting on this cake is juxtaposed with elegant flower blossoms. 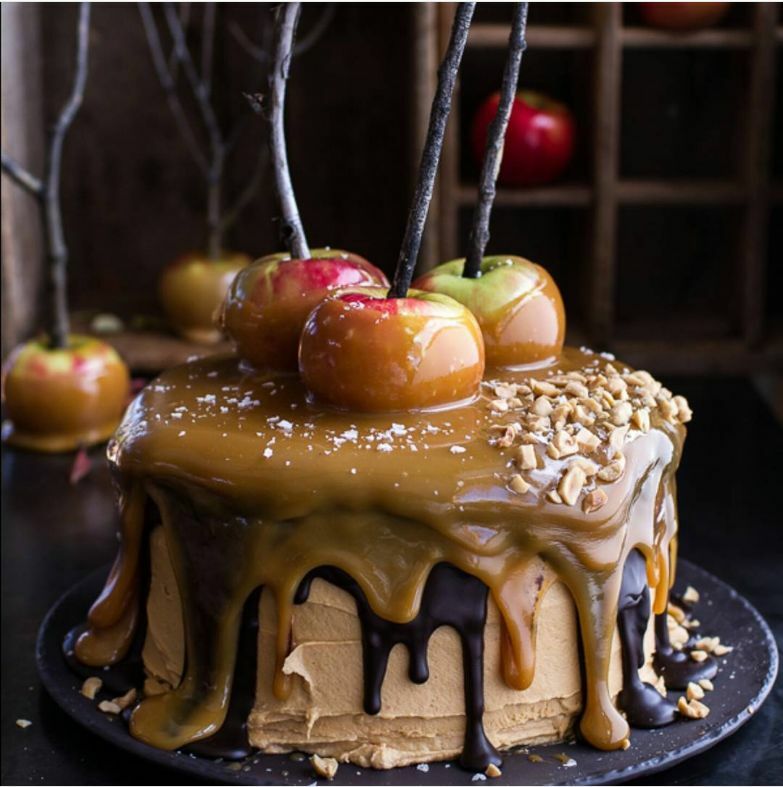 Embrace the season of caramel apples and carnivals with this ooey-gooey autumn wedding cake. 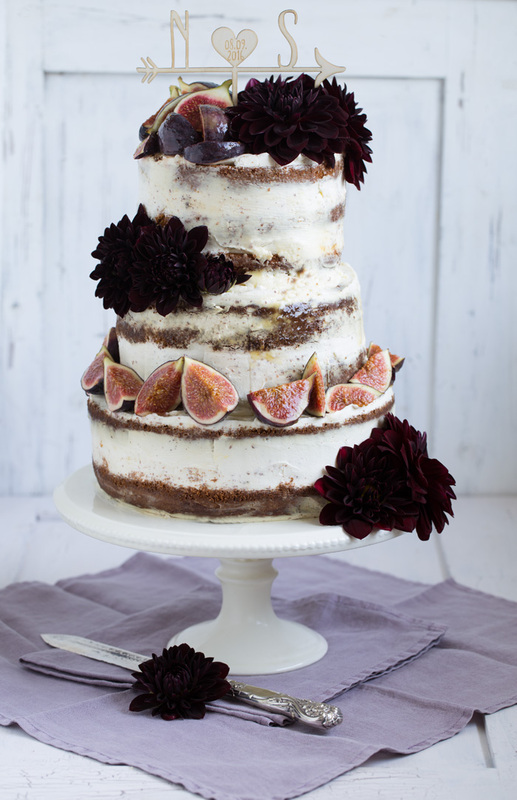 Combine trendy, Earth geodes with autumn flowers to create this stunning cake. 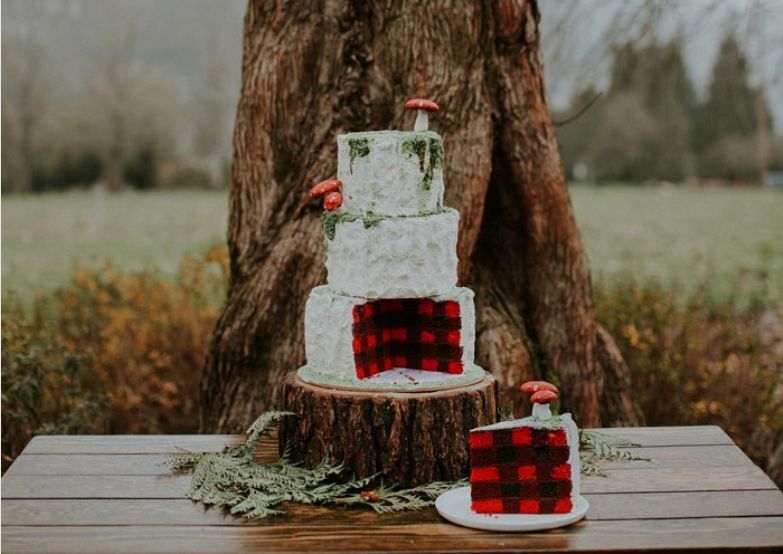 On the outside, this cake is decorated with edible mushrooms and moss; inside, reveal the flannel. 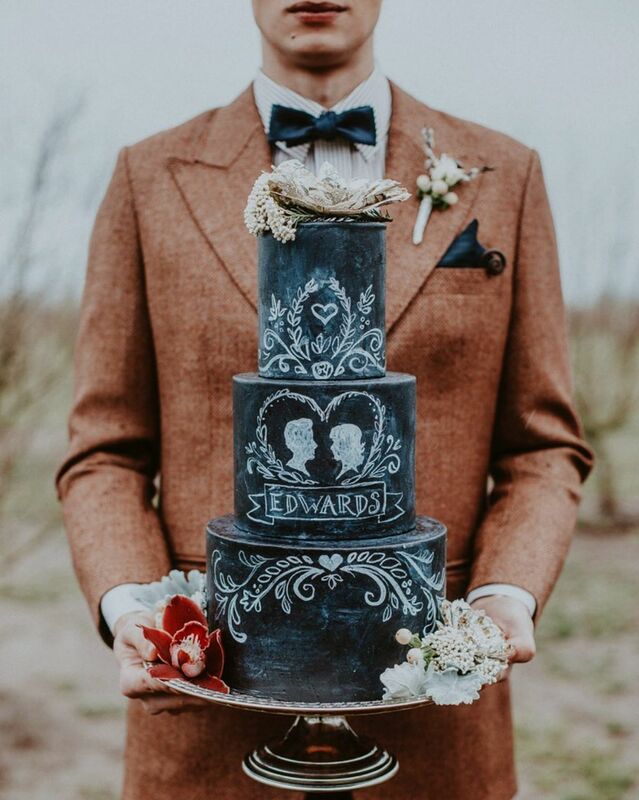 This dark and moody chalkboard cake blends seamlessly with woodsy, elegant autumn decor.